Religious or spiritual, it can be said that our lives revolve around a centric figure larger than our imaginable selves, a force so magnetic we can't help but be drawn in -- to which we entrust our faith, for which we sing our prayers, and with which we carry ourselves the moment we leave the comforts of home to attend to our day-to-day jobs, the time when we are basking in our successes that we are so apt to share them with the persons closest to us and with our kindred spirits genuinely backing and pushing us up for us to triumph in our endeavors akin to theirs, and when our idyllic lives roll in on a loop in our sound sleep. We latch onto the force with grains of truths we don't see -- those we were taught to believe in since the day we said hello to the world and those we've learned all by ourselves, through the books we have secretly devoured and through the people we have chosen to have an impact on our lives -- notwithstanding our being visual beings most of our lives. We believe in an amount of things intangible -- things only the heart can feel. But it's a gamble -- a difficult, excruciating choice of laying our precious trust on the unseen. To some, we will have to be dauntless, to question institutions without fear to validate our own thoughts, emotions, and all that's written in the quaint book, to fend for our empty, starving selves. In so doing, we hopefully find ourselves thrusting stakes into the ground, drawing the line between truths and falsehoods. We are on a quest for what makes sense to us, for what ultimately brings us true bliss, whatever that may be. When, finally, we have found the truths -- the deemed truths -- and inner peace, the thought of being alone escapes us. We're left with a happy gamble, knowing that there is a higher being -- the one figure who is around anytime, ready to lend a persevering ear to frustrations others may find petty, anticipations others may dismiss as overreactions, sorrows others may never comprehend, hopes others may ridicule, dreams others may have dashed to pieces to wantonly shove their bloated egos into our little selves. We talk to the unseen, in the quietest time of day. It's the kind of conversation that shed light on the deepest recesses of our soul. It is uplifting, it is enlightening. 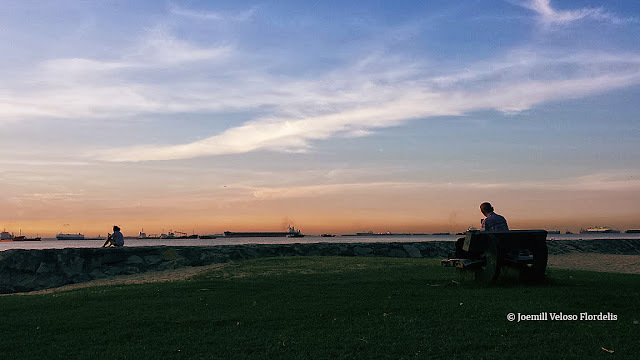 In a park, in Singapore, years back, just when my cousin and I were through with jogging laps, she had noticed a meaningful scene, actually a paradox tickling her heart -- too visceral, too profound not to capture. There was a young girl, a teen perhaps, sitting in near-fetal position on the dike lapped by the morning sea, and then there was a bald, slightly bent, old man quietly seated on a bench. Both of whom were looking, staring at the same faint orange horizon but hooked onto opposite directions. To our minds waxing poetic, the young girl was thinking long and hard about her future, as she grappled with struggles in school and in a judgmental society she's in -- while the aged man was reminiscing about the summers spent with loved ones, his carefree childhood, how handsome he was in his prime, his battles fraught with wins and losses, the fruits of his hard work, thanking all there was and is in his life.